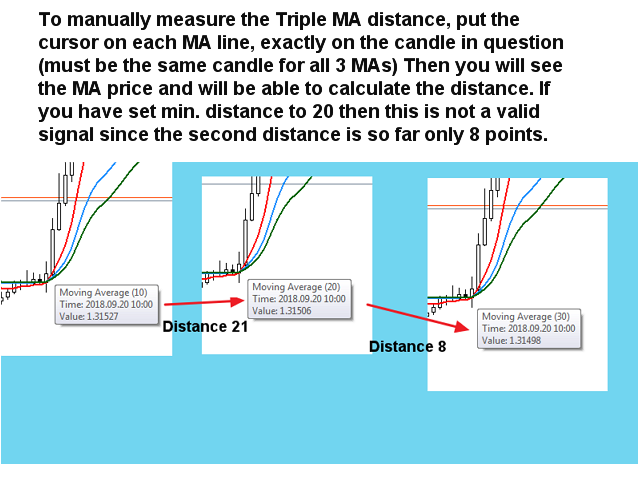 when 3 moving averages (MA) are in consecutive alignment and at a certain distance from each other. It adopts a not very well known strategy used by some institutional traders. It involves the MAs 10, 20 and 30.
on classical moving average crossover, i.e. when a fast MA is crossing a slow MA from above or below. on Heiken Ashi smoothed colors change. Due to the numerous amount of settings the Expert Advisor is mainly aimed for the intermediate to advanced trader who already has experience with or understanding in trading the different strategies offered by the EA. Please also note that I do not provide with any trading advices, signals or preset files. Possibility to select between adding a fixed lot or let the system set the lot size according to risk percentage. Possibility to trade in a reverse way (buy when sell, sell when buy). 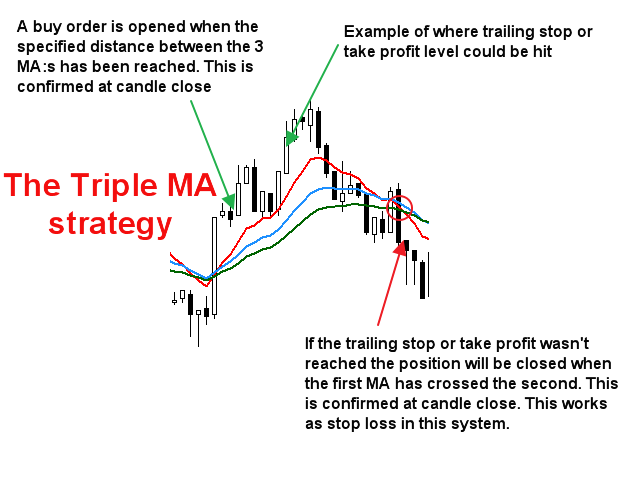 For the Triple MA strategy for example by setting a very wide distance between the MAs which could indicate a reversal. The EA does not comply with NFA FIFO regulations if you use a strategy which will open several orders. This strategy can of course also be used in a more universal way by using other MAs than the ones which are intended for the strategy. Look for a trade when all 3 MAs are aligned and the minimum distance between each of them has been reached. Exit when trailing stop or any other condition (described in the blog) has been hit. It is recommended to trade a portfolio of minimum 6 symbols at the same time to reduce risk as much as possible. Please make sure that you test the EA on a demo account and let at least 10 trades be done for each strategy you would like to use before going live. You could use the M1 or M5 time frame for this purpose. Please always perform proper back testing of your setup in the Metatrader Strategy tester. Please find the description and explanation of the input parameters here. I demo this EA for just one day and I can tell its a Game changer.Good job! The author responds in time too.